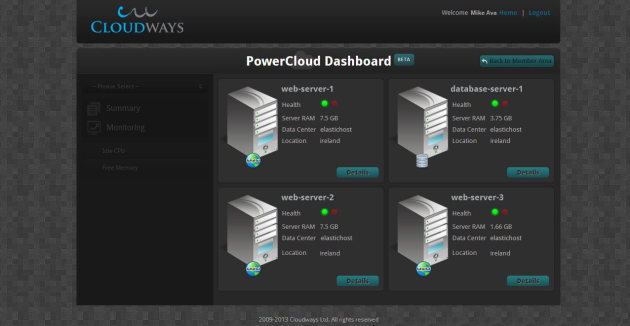 Today we’ll be having a look at a hosting service provided by Cloudways. This company does server management for its clients and partners with Cloud providers like AWS, Elastichosts, Linode etc. A client can thus choose their own hosting platform, but leave all the technicalities in the hands of the Cloudways team. 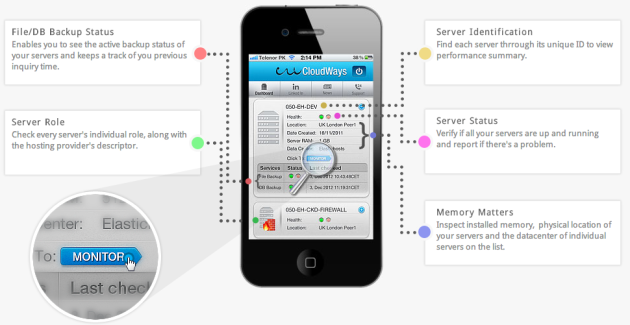 Cloudways offer two main hosting services, Click&Go as well as PowerCloud. We will be focusing on PowerCloud today. Before we start, what’s the difference between the two? The Click&Go plan is catered towards independent bloggers, designers/developers and small businesses. Their easy to use application console helps you deploy and manage your desired application with a few clicks. It is also a good option for clients who want Cloudways to deploy, manage, monitor and resolve any website/app issues, so they can focus on other aspects of their business. This plan is currently being updated and will be relaunched in September. Analysis > Migration Path Proposal > Cloud Infrastructure Design > Migration > On-going maintenance/support. Since PowerCloud is a custom built service, there is no trial for it or anything of the sort. Therefore in this review I will be relying on my outside impression of the service as well as information gathered through their website and through personally discussing their services. PowerCloud is ideal for businesses and larger websites who would like to outsource complete infrastructure and application level management in order to focus more on core business rather than system administration and management. Cloudways design the complete setup, develop it, manage it, monitor it and troubleshoot it for customers. Varnish, Memcached and APC Config. For more technical details, you can check their FAQ section. Lets take a closer look at the WordPress-specific features of having a PowerCloud account. Are you fuzzy with those terms? Well, what that means is that Cloudways places a lot of importance on making your website go as fast as possible (slower sites equals less customers nowadays). Google also takes into consideration your site’s loading time when determining rankings, so it pays to invest in the technologies above. They use Nginx as the server (it’s faster than Apache), and also run extremely lean systems (no panels, no GUI and nothing fancy) to maximize performance. That means most of your pain is eased, as you’ve got competent people taking care that your website is using the latest version of WordPress core and is running the latest updates with regards to plugins. What this means is that you’re much less likely to get hacked due to a core or plugin vulnerability. Moreover, if upgrading breaks something due to for example plugin compatibility issues, Cloudways again comes to the rescue by fixing things for you. How about 24×7 managed backups? You can keep your mind at rest that there are always other versions of your website stored securely and available to roll back to if needed. Lets come to security, a perennial hot topic for all online services. PowerCloud customers get a fully dedicated virtual cloud server on the cloud provider of their choice (Amazon AWS, Elastichosts, Cloudsigma, Linode). The Cloudways team of course implement all the necessary security measures to make sure that there are no vulnerabilities in WordPress core or the plugins you have installed on your site/s. They also help install SSL and take care of PCI compliance. The nice thing is that this is a very scalable. You can bring new websites on board at any time, and Cloudways will help you with migrations from other servers, you just need to make a request and they’ll handle things for you. SFTP access to upload/download files securely. SSH access (with pseudo privilege) for tech-savvy customers. That’s not all however. The PowerCloud dashboard is now in beta, and it lets you check CPU Idle time, available system memory and other crucial server performance metrics in real time. The uncluttered and easy to navigate dashboard has just the instrumentations & controls you need for optimal server monitoring. 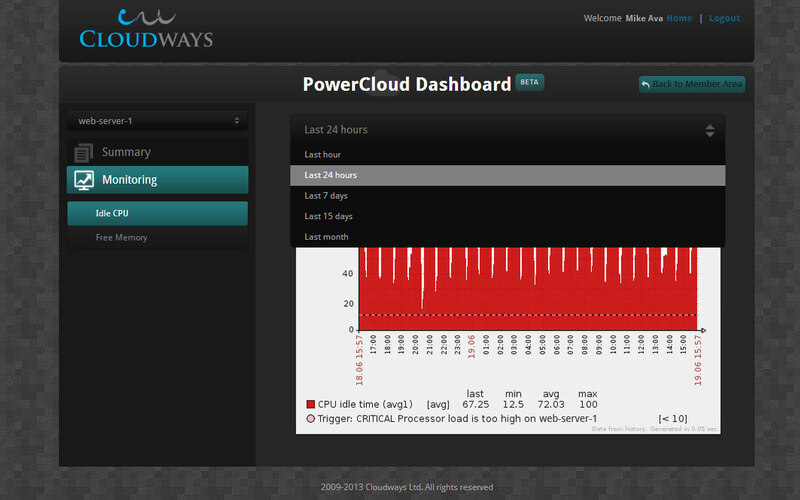 Below you can find a few screenshots from the PowerCloud dashboard. 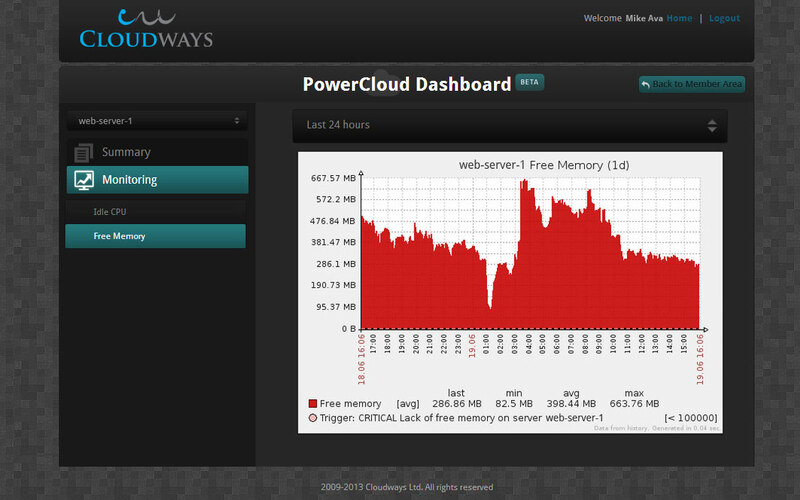 I think you’ll agree with me when I say that it looks pretty slick to have such stats in your hosting dashboard. Besides presenting vital stats for each server, you can also inspect the role of each server’s individual (e.g. Web, DB, Dev), along with the hosting provider’s descriptor. The speedometer displays CPU Idle time and enables you to analyze server performance at different time intervals with reference to traffic spikes. The area chart provides detailed overview of memory utilization and available memory over a given time period. You will be able to determine peak and off-peak times for efficient resource utilization. Apart from the dashboard, I was impressed by the Cloudways iOS server monitoring tool which can be found for download on iTunes. It’s a very cool app and with it you can monitor your server from wherever you are. It also has an easy to use support and live chat page which can be used to quickly contact support if anything goes wrong with your site. With Cloudways PowerCloud you get Live Chat and 24×7 managed support. I’ve found them very responsive and helpful when trying out live chat, and have no doubt that they are just as responsive via email. The PowerCloud service starts from $99. Since it’s a custom service, there are no pre-set prices. Interested parties are invited to email Cloudways with their requirements, or you can also use live chat to kick start things. Once you give Cloudways your site’s specs, they will use their knowledge to give you a quotation with a cloud solution that has enough resources to serve your site most efficiently. Given the features we highlighted above, the starting price of $99 is very decent. PowerCloud customers are charged at the end of the first month of their management subscription with Cloudways. No contract is made for any of the plans. You will always be billed on a monthly basis for the services utilized in the previous month. Cloudways accept all major credit cards i.e. VISA / MasterCard / AMEX and you can also request to make your monthly payments through PayPal. I have a hunch that most people like to see some pricing guidelines before they get interested in a service, so it would probably be better if Cloudways gave a better indication of the costs involved. Maybe they could include some sample projects and their requirements + costs, so people can compare them with their own sites and get an idea how much it would cost for them to host with Cloudways. On the other hand, Cloudways do have a very good quotation request form where you can enter the details of your hosting requirements, and they get back to you with an estimate quite rapidly. I hadn’t heard of Cloudways before, but they seem to be offering a solid service. They are approaching angle from a different angle than the two streams we’ve seen till now. The current WordPress hosting market till now has been largely shared between shared hosting providers and WordPress managed hosting providers. Cloudways PowerCloud is a custom management offering which is tailor made for each client, making it an ideal option for a certain type of customer. It can be the right choice for those whose website has experienced a surge in popularity and is outgrowing its shared hosting allocation. It can also be the ideal platform for those building an app on WordPress, or a large scale multisite system. These type of setups typically not only require more resources, but a more personal service with regards to server management, and tuning which is strictly tied to the needs of that particular application. I’d like to stress again that Cloudways PowerCloud is a management service, so you don’t host on their servers but on one of their partners’ servers. By letting you bring your own cloud hosting account, they avoid lock-ins and you’re able to retain 100% ownership of your data and cloud infrastructure. If for some reason you’re unhappy with the PowerCloud service, you can discontinue and walk away with a functional infrastructure. I think that’s a nice thing and could be a major factor in some people’s decision making process when choosing for a hosting solution. What do you think about the PowerCloud offering from Cloudways? Thanks Jean for posting this informative article! After re-reading it, I do see promise in this service. I think that it would also be helpful for development companies that manage their clients’ Websites through a single hosting account. 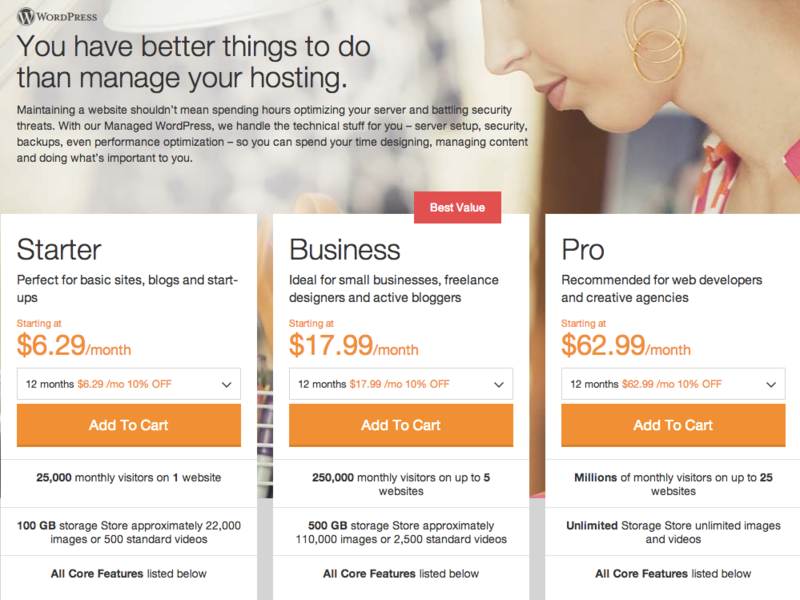 Many hosting companies won’t provide support to reseller accounts. With Cloudways, it sounds like you can get the best of both worlds: the profit / cost advantages of a reseller’s account while outsourcing technical support. Also, it sounds like Cloudways competes with WordPress maintenance companies such Maintainn and WPUpkeep.